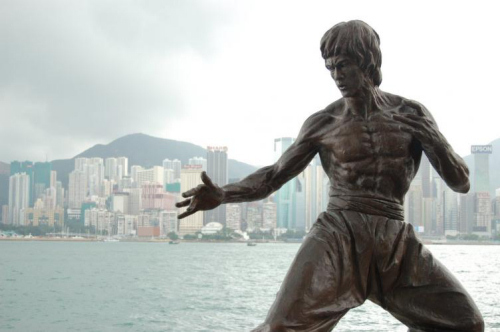 In 32 years, Bruce Lee revolutionizes the world of martial arts through his knowledge and his philosophy. Thanks to his unremitting work and his productions, he becames a legend and he is recognized as the most famous martial artist of the 20th century. Bruce Lee was born at San Francisco, the 27th of November 1940, between six and eight o’clock, at the Jackson Street hospital. His parents called him "Li Jun Fan", but a short time later, “li” has been changed into his American homonym "lee". These names and surnames were in fact feminine and meant "Little Phoenix", it was a trick from his family to protect him: they were very religious and they were followed a Chinese legend which says that some daemons are used to kidnap boys at the childbirth. Later, Lee Jun Fan took back his real name, Hsui Loong, that meant "Little Dragon". The hospital attendant gave him a second name, Bruce, to americanise him, but no one called him again by this name before his twelfth year, when he decides to subscribe at the English school of his country. In 1941, he went back with his parents to his family house, in the district of Kowloon in Hong Kong. The little flat located at 218 Nathan Road was the house of Bruce during his childhood. At the age of six, Bruce began to acquire a certain charisma as well as some values that will make him become famous. He had some important parts in several movies like "The Beginning of a Boy", "The birth of Mankind", "My Son Ah Cheun" and some minor roles in about twenty other movies. Then, he began to study at a secondary school called "La Salle" in 1952. The year 1953 was decisive for Bruce Lee. He had a lot of problems with a gang of his district and he finally lost a fight against a member of this gang. After this defeat, he began to learn the art of Wing Chun with master Yip Man. His natural velocity and timing certified him to excel in this complex art. In addition of his martial arts training, Bruce also took some lessons of Cha Cha, a Chinese dance very appreciated at this time, besides, he was very good and won some prizes in competitions. In 1958, Bruce vanquished the boxing champion of Hong Kong, who had kept his title during three years. After that and as many teens of this time, Bruce was suspected of unlawful activities or of being linked with gangs. As he had participated in some street fights, he drew attention of the police. Terrified by the bad influence of these things, Bruce Lee’s parents decided to come back to San Francisco to complete decently his education. At San Francisco, there weren’t any problems. Not only Bruce worked in a restaurant of a Chinese district to earn a bit of money but also had he subscribed at the Edison Technical school to obtain a diploma. To pay this school, besides working in the restaurant, he taught martial arts in lanes or parks to the local inhabitants. 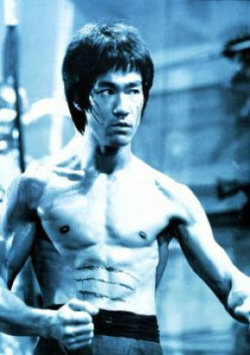 During this period, Bruce developed admirably his fighting style, his philosophy and his physical abilities, which become more and more impressive. In 1963, he opened his first school, "Jun Fan Gung-Fu", wherein he taught martial arts as he understood them. We could learn there some techniques that can be applied in street fights, against armed opponents or not. During this time, he met Linda and fell in love with her. In 1964, encouraged by Linda, Bruce moved his school in a campus. He benefits from the fact that there were a lot of students who were interested in learning some fighting techniques. Then, Bruce met Jhoon Rhee, who was considered as Taekwondo’s father in USA, and they became friends. 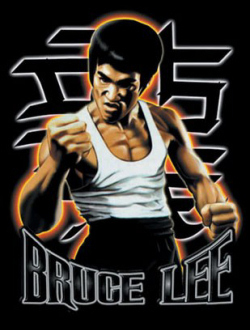 Many times, Rhee invited Bruce to take part in shows or martial arts championship in Washington. 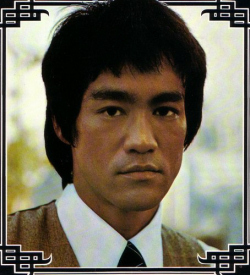 Next, Bruce opened a second school at Oakland and asked his friend Taky Kimura to teach there. The 2nd of August 1964, Bruce made a show of his ability at the International Championship of Karate at Long Beach in California, thanks to Ed Parker’s invitation, a master of Kempo. People was fascinated by Bruce's abilities which was very impressive. The mob mostly remember his push ups with only one finger or his incredible "One inch Punch", a Bruce made technique: Bruce put his hand at few inches from the chest of the opponent, and thanks to a very short hit, he repels him to several feet whereas it seems that Bruce Lee doesn’t make any effort. Here are two videos of this famous one inch punch: Video 1 | Video 2. After a passionated love story, Bruce married Linda the 17th of August 1964 and they went to live at Oakland, in California. Encouraged by his wife, Bruce went on teaching in his Oakland school. This school is opened to everyone, not only for Chinese people. Because of that, the other masters of Chinese martial arts, who only taught to Chinese persons, saw Bruce Lee as a threat. Chinese masters chose Wong Jack Man, a master who taught Kung-Fu, to challenge Bruce Lee: if this master won the fight, Bruce Lee would have to stop teaching his art, and conversely, if the master loose, he would have to stop teaching. Before the fight, Wong, cowed by Bruce’s reputation, tried to lay down some rules about the techniques that may be used. Bruce was furious and insisted to make a free fight. Bruce easily won thanks to his own fighting style. Despite this easy victory, Bruce was convicted that he had spent too much time to beat his opponent, so he began to review his style. Then, he made up the concept of "Jeet Kune Do": the goal is to create the fighting style which is the most appropriate for someone who have to stand up for oneself. He used for that the most efficient techniques of sundry martial arts as Wing Chun, Thai Boxing, Judo and Karate. The principle of this fighting system wants to make a "style without style": an ideology and a physical training which condition the spirit and provoke reflex, without any logical schemas between movements unlike other martial arts. So there are no Katas in Jeet Kune Do. In 1965, the first of February, Linda gave birth to their first child, Brandon Bruce Lee. 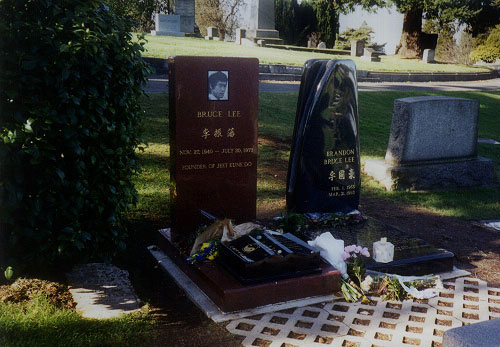 Seven years later, Bruce received a letter from Hong Kong acquaint him about the death of his father. Almost immediately, he went to China, alone, eaten up by sadness, to be at the funerals. After having spent time with his mother, he came back to United States in September 1965. Then he moved to Los Angeles with his family. He turned many films at Hollywood and in 1969, Linda gave birth to a second child called Shannon Lee. 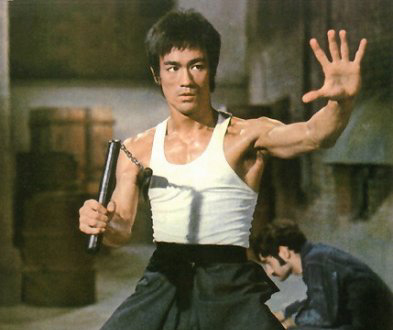 During this time, Bruce began to train with Nunchaku and he incorporated this weapon in the films he played. Nunchaku quickly represented him across the world. Then, he turned many movies until 1973 and all of them has a lot of success. A little time before the release of his last movie called "Enter the Dragon", which made him become an undisputed star, he succumbed from a serious aneurysm the 20th ofSeptember 1973, before he could receive the award that he deserved for his movie. His dead was owed to an allergic reaction to Meprobabate, a component of tablets against headache called "Equagesic". Bruce is dead at the Queen Elizabeth hospital in Hong Kong. He received national funerals which were seen by ten millions of persons. Later, private funerals were also organized by his family at the Lake View cemetery in Seattle, the 31st of July 1973. Bruce was 32 years old. Nowadays, Bruce Lee is still a star all over the world. Many persons considered him as an example for his acts and his philosophy. His martial art, the Jeet Kune Do, is now taught all around world and gathers more and more persons. He also made famous the use of Nunchaku who also gathers more and more people. "Be like water making its way through cracks. Do not be assertive, but adjust to the object, and you shall find a way round or through it. If nothing within you stays rigid, outward things will disclose themselves. Empty your mind, be formless. Shapeless, like water. If you put water into a cup, it becomes the cup. You put water into a bottle and it becomes the bottle. You put it in a teapot it becomes the teapot. Now, water can flow or it can crash. Be water my friend."